Several times a year an atmospheric river—a long, narrow conveyor belt of storms that stream in relentlessly from the Pacific Ocean—drops inches of rain or feet of snow on the U.S. west coast. Such a system triggered floods and mudslides in central and southern California this past weekend. Yet only in the past few years have weather forecasters been able to predict roughly how strong the imminent storms may be. Now they have a new rating system to help them—and the public—understand what an incoming atmospheric river might unleash; on Tuesday researchers unveiled the “atmospheric river scale.” It ranks severity and impacts, from category 1 (weak) to category 5 (exceptional). “Without a scale, we really had no way to objectively communicate what would be a strong storm or a weak one,” says Martin Ralph, director of the Center for Western Weather and Water Extremes at Scripps Institution of Oceanography, who led the work. 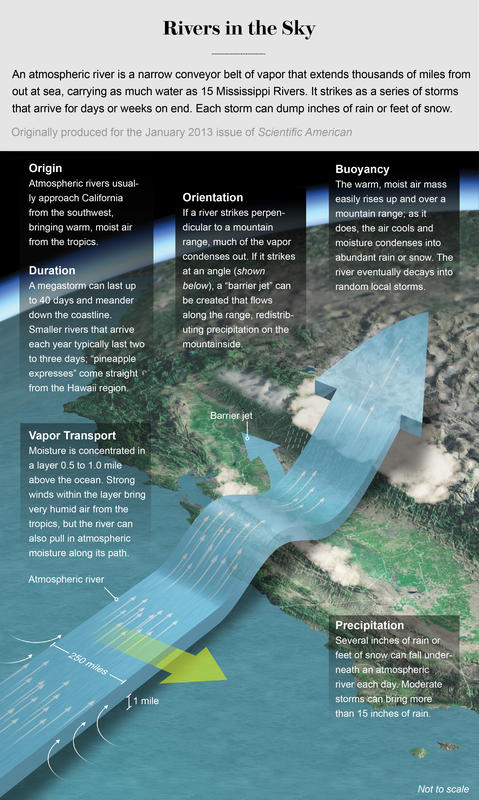 Atmospheric rivers flow through the sky about a mile above the ocean surface, and may extend across a thousand miles of ocean to the coast. Some bring routine rain but the more intense systems can carry as much water as 15 Mississippi Rivers. The series of storms striking land can arrive for days or, occasionally, weeks on end. They hit west-facing coastlines worldwide, although the U.S. experiences more than most other national coasts. Satellites can see atmospheric rivers growing over an ocean, but the resulting data is not detailed enough for an accurate forecast. Since 2012 scientist and engineers have been gradually building a system of ground-based sensors, including radars that look skyward as the first storm comes ashore, to add moisture and wind data to weather models. Combining all that information can improve forecasts of how much precipitation may fall, and for how long. Still, weather forecasters and emergency planners did not have a solid way to assess how serious potential flooding might be—or, at times, if the rain or snow would actually be advantageous. “Scientists, the media and the public viewed atmospheric rivers as primarily a hazard,” Ralph says, “but the weaker ARs are quite beneficial.” If farm soils are dry or if snowpack or water reservoirs are low, an atmospheric river can revive withering crops and fortify municipal water supplies. “Water managers made it clear to us that a rating scale would be helpful,” he adds. For example, if reservoirs are high and heavy rain is coming, managers might release water from behind dams so they are not stressed or overtopped later. The scale does not have a formal name such as the Enhanced Fujita scale for tornadoes or the Saffir–Simpson scale for hurricanes. And it differs in a key way: Those scales focus on hazards but not potential benefits—although it is unclear if a hurricane or tornado could have any constructive effect. Also, unlike the others the new scale considers storm duration a fundamental factor. After Hurricane Harvey stalled over Houston and Hurricane Florence got stuck over the Carolinas—both creating much more flooding and damage than anticipated—the Saffir–Simpson scale was criticized for not adequately conveying the risk of hurricanes that are very slow moving upon landfall. Researchers are considering whether they could possibly predict if an upcoming year will have many atmospheric rivers, which Ralph says can make the difference between states such as California having a year of drought or flood. A seasonal or annual forecast could help farmers decide what kind of crops to plant and help municipal planners decide whether to curtail water use to safeguard reservoir levels.